Good nutrition is the foundation of everyday good health and happiness! Pets Prefer Daily A to Zinc formulations provide your dog with a complete spectrum of essential Vitamins, Chelated Minerals and Fatty Acids. 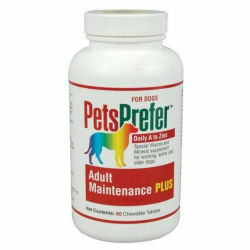 The Adult Maintenance PLUS formula supplies nutrients balanced just for dogs plus Ascorbic Acid (Vitamin C), Biotin and Vitamin K.
Adult Maintenance is intended for intermittent or supplemental use only and is not a complete food for dogs. The chewable tablets can be utilized as a treat or crumbled and mixed with food. Dogs over 20 lbs: 1 tablet daily. Poultry Liver, Maltodextrin, Microcrystalline Cellulose, Dicalcium Phosphate, Fish Meal, Lecithin, Choline Chloride, Magnesium Amino Acid Chelate, d-Alpha Tocopheryl Acetate, Iron Amino Acid Chelate, Zinc Amino Acid Chelate, Silicon Dioxide, Magnesium Stearate, Ascorbic Acid, Vitamin A Acetate, Biotin Supplement, Niacinamide, d-Calcium Pantothenate, Copper Amino Acid Chelate, Menadione Sodium Bisulfite Complex (Vitamin K), Riboflavin, Manganese Amino Acid Chelate, Vitamin B12 Supplement,Vitamin D3 Supplement, Thiamine Hydrochloride, Pyridoxine Hydrochloride, Cobalt Amino Acid Chelate, Potassium Iodide, Folic Acid. * These compounds are not recognized as an essential nutrient per AAFCO Dog Food Nutrient Profiles.